FAQ – What is a Mortice Lock? A: These T14 – Mortice Locks come in 45mm or 60mm Backsets. A Mortice means to cut a hole or recess a part which is designed to receive a tenon of the same dimensions. Mortice Lock is to be ‘morticed’ into the door. These locks open and close by pushing the lever arm down and locking with a cylinder. These are used in junction with the Long Plated Euro Levers and T39 – Euro Cylinder or T49 – Single Euro Cylinder. FAQ – What is a Roller Lock? A: These T3- Roller Locks come in 45mm or 60mm Backsets. These are ideal to use with Entrance Pull Handles. These locks are operated by a push or pull motion. These hold shut without locking, great to go in and out without getting locked out.. You can lock the door as necessary. These locks are used with either our T39-Euro Cylinder or T49-Single Euro Cylinder and your choice of escutcheons, T16 Round or T59 Square and any Entrance Pull Handle. FAQ – What does Backset mean? A: It is the horizontal measurement from the fold on the door edge to the centre of the keyhole lock. See below for an example. FAQ – How to Clean my Stainless Handles? FAQ How to choose your Handles? A: As all handles come in various sizes, finishes and styles, choosing a handle can be answered with 3 easy questions. What size is needed for your space? What style or theme are you going for? If you have answered at least 1 or 3 of these questions, you are on the road to choosing your perfect handle. When choosing the right handle it is about the look, the comfortability and functionality. Click here to see our Blog for Hardware for a Small Kitchen, Planning the Hardware for your New Kitchen or Practicality Vs Functionality. FAQ – What is Dummy, Passage and Privacy mean? A: Dummy Lever Door Handle is a handle that has no latch mechanism. So they are mounted and do not required to be morticed or need a hole through the face of the door. Dummy Handles are stationary handles that are used for double doors, pantries, linen cupboards or storage cupboards. Passage Lever Door Handle is a handle that is used for a door that does not need to be locked. The latch is released when the lever arm is pushed down and allows the door to open. To shut the door the latch that protrudes out closes the door and keeps its closed. Latch or Passage Door handles are commonly used for bedrooms, studies or a door that does not need to be locked. Privacy Lever Door Handle is a handle that is used for a door that needs privacy. Privacy sets are used where a locking purpose is required. These have either a thumb turn or snib that enables you to lock from the inside and has an emergency release access hole or slot on the outside. These Privacy Door Handles are commonly used for Master Bedrooms, toilets, bathrooms or any room that may require privacy. FAQ – How to determine Left hand or Right Hand Levers? 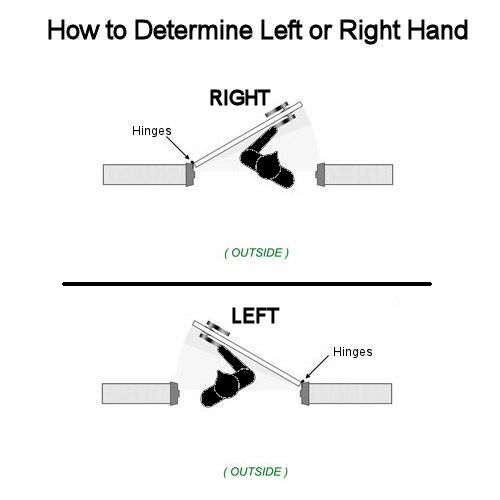 A: Only our L8 – Freemantle Levers apply for determining Left Hand or Right Hand. Please refer to diagram below. All other levers are universal. Handing – Is determining if a door is Left Hand or Right Hand. “Handing” of your door handle is knowing which location of the handle is on to operate. Handing must be determined for each door. You often will need to know handing if you are ordering a door lever or an entry door handle. 1. Stand on the outside of the door. For instance, if you are getting the handing for your front door of your house, stand outside the house; if you are getting the handing for a bathroom/toilet door, stand outside the bathroom/toilet; for a bedroom stand outside the bedroom etc. 2. Face the door, see what side the lever/knob is located on, “Left Hand” is the handle on the left side of the door. “Right Hand” is the handle on the right side of the door. It’s that simple!! Ignore which way the door swings. Use the diagram below as an additional guide to determining left or right hand.